A new software system designed by a UB aerospace engineer will help NASA detect and find air leaks in the International Space Station. The software will be installed in NASA's mission control when the manned space station is expanded from its current eight-module configuration to its final 15-module configuration, according to John L. Crassidis, associate professor of mechanical and aerospace engineering in the School of Engineering and Applied Sciences. A UB aerospace engineer has designed a software system to help NASA detect air leaks in the International Space Station. Crassidis developed the software with UB aerospace engineering graduate student Jong-Woo Kim and Adam L. Dershowitz, an engineer with United Space Alliance. Their work was funded by a $158,000 grant from NASA. The software can determine in which module a leak has occurred and, in some cases, can pinpoint exactly where a leak is located in the module. The software also can calculate the size of the hole that caused the leakage of pressurized air from the module. Currently, the protocol for finding a leak within the space station involves the time-consuming process of sequentially closing off each module to determine which one is the source of a leak. After a module is closed off, a change in space-station air pressure indicates whether the module was the source of the leak. The software developed by Crassidis and team continuously monitors the space station for leaks and in less than a minute can plot possible leak locations on a diagram of the space station. In some cases, the software can show the exact location of a leak within a module, in others it will suggest two or three possible locations. "The idea is to localize the leak," Crassidis says. "It's a time saver for the astronauts and is a life saver, in a sense, because time is crucial when you're dealing with a leak." When a leak occurs, the software system detects a disturbance in the spacecraft's behavior. 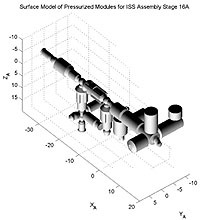 The software correlates the effects of this behavior with the geometric structure of the space station. This comparison results in predictions for leak location and the size of the hole causing the leak. "Other disturbances are always present, such as drag and solar wind," Crassidis explains. "We've developed very detailed models of these other disturbances, which are used to separate out these effects from the leak, thus isolating the leak disturbance." The software can locate holes with a diameter of .4 inches and smaller, according to Crassidis. Such holes can be caused by particles of space debris traveling at up to speeds of 17,000 mph. NASA tracks from the ground space debris greater than .5 inches and can direct the space station to maneuver away from incoming debris. The space station also is equipped with a shield designed to catch debris and micrometeoroids. Crassidis's software is intended as a backup to those systems. It also can detect leaks caused by in-space collisions, as occurred when an unmanned cargo ship collided with Russian Space Station Mir in 1997. "NASA spends a lot of time and money making sure nothing hits the space station," Crassidis says. "This software will be part of a contingency plan if the wall of a module were to be punctured." NASA had planned to finish the space station in 2004, but completion has been pushed back to 2008 as a result of the Columbia Space Shuttle disaster and the investigation into the cause of the tragedy. When the space station is completed, an international crew of up to seven will live and work in space between three and six months, according to NASA. Crew return vehicles always will be attached to the space station to ensure the safe return of all crewmembers in the event of an emergency.